I’ve started working on a simple webgl game, and after just 4 days of development it’s already sort of playable. You can go ahead and try it out right now. The game is playable but it is far from finished. There are some bugs and graphical glitches here and there and the block generator isn’t perfect yet. After a while, as the blocks start to speed up, the amount of them on screen decreases, which is quite the opposite of what I want. I didn’t want to waste too much time fine tuning it just yet, because I will be adding some more powerups that are going to affect the flow. I’ll need to add a couple of screens as well, to explain the controls (by the way, you move with left, right and restart with space) and to make it a bit more apparent when you die. Adding high scores is on the TODO as well. Once all of this is done, I’ll try to include as much fun stuff as possible, maybe even a secret cow level! I’ve done some webgl work in the past (a school project, be warned it’s horrible. It’s a steep learning curve in the beginning, but once you get accustomed to vertex/fragment shaders it gets easier and, I dare say, fun! The only thing I really missed is the lack of hot swapping support. I’ve tried a few chrome extension, but none of them worked well enough. The most promising was tincr but it didn’t work reliably enough to actually be useful. This is actually my first game, so any tips and suggestions will be greatly appreciated! 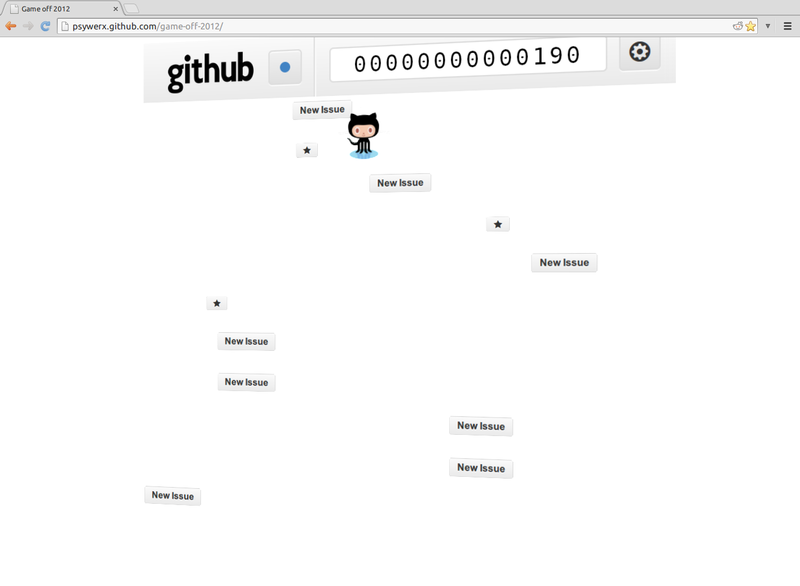 I hope the good guys and gals at github won’t mind me borrowing their graphical assets. I’ve tried creating my own textures, but they all look horrible. I am totally useless when it comes down to drawing stuff.